Explore Venecia a pie y visite las principales atracciones de la ciudad, como el Palacio Ducal y la Plaza de San Marcos. Both days were fabulous and welll organized. Driving through the Dolomites was spectacular, especially since it had snowed hard the day before. Apart from the scenery, sights like the Olympic ski slope, a huge dam, etc. I especially enjoyed seeing the places where Titian lived and worked. Dinner at a lovely restaurant with fellow travelers was a lot of fun. The guide, obviously very new at the job, was very friendly and personable. My advice for those choosing to take the tour this time of year is to dress very warmly even if Venice does not warrant it. Despite the pouring rain the next day, the aqua alta with the flooding, the walking tour was great and because the guide, who was very passionate about her city, knew it well, enabled us to bypass many obstacles. The boat tour in the afternoon was very enjoyable as well. Fully recommend this and hope to repeat it one day in better weather! 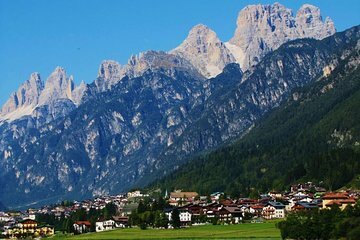 Don't miss the trip to Dolomite Mountains. Our guide was excellent, very informative, and created a fun day! Loved this tour and our driver Justin was fantastic. It was a great day out with spectacular scenery and Justin knew all the best places to stop and eat. Definitely recommend!! This was our favourite tour of the trip. Our day in the Dolomites with Justin was beyond memorable. Some of our best pictures are from this tour and we were on a 3 week honeymoon. Justin was a great driver, he was kind and full of so much information. He knew it was going to rain and continued to watch the radar and tour us around until it was upon us. That is when we stopped for lunch. It rained for the hour while we ate and then we were back to touring! The lunch was AMAZING!!! The entire meal was our favourite of the trip!!! I couldn't recommend this portion of the tour any more, honestly!!! Well worth the cost!!! For the skip-the-line portion we had Marco for the walking tour. He is tall and easy to follow in the large crowds of Venice. He is witty and charming and could answer any of our questions. Our water boat tour was with Christina. We loved doing this portion of the tour. It was a great way to see all of Venice and not deal with hiring our own taxi!!! This tour was a perfect way to see all of Venice highlights in one day and the beautiful stunning Dolomites another day! Wonderful to get into the mountains for a day. Beautiful sights with a knowledgeable guide. We especially enjoyed Cortina. They sub let to a local company who are a waste of space. No positive feed back in years. Great customer service and wonderful tour guide. We were split into two vans, men and women. The women had a great tour with Justin. The men's guide was less than friendly but in both instances the tour was without question one that you would not want to miss. The Dolomites were beautiful. Fantastic day with spectacular scenery.